Background: El Hadji Baye Lamine Niass, a member of the Niassene family of the Tijaniyya confrérie in Senegal, is the honorary president of the Mame Astou Diankha Association. Apart from his religious activities, his work focuses primarily on community development, particularly on education and health. Lauren Herzog of WFDD met with him in November 2014 to learn more about the Niassene family. 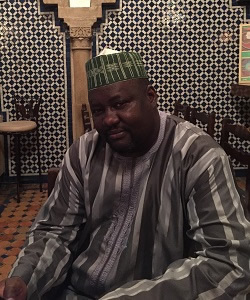 El Hadji Niass discusses the origin and mission of the Niassene family, their hierarchical structure as a family as well as within the Tijaniyya, the family’s devotion to education and other social development issues, and their involvement in family planning and the Senegalese working group. This discussion is part of a series of interviews conducted during a visit to Morocco with Senegalese religious leaders, as well a broader effort to map the roles that religious ideas, institutions, and leaders play in development efforts in Senegal. I grew up in Kaolack [Senegal], surrounded by my family. As in all of the religious families, I began my studies with the Qur’an; we learned the Qur’an and we were also sent to school. Given the development and progress in the world, we can no longer be satisfied with only studying religion. It’s equally necessary to learn how to work and communicate with the rest of the world. After the baccalauréat [high school diploma equivalent], I studied accounting. I then began a professional life, but still remained in touch with my family and observed the standards that we are obliged to respect. Then I began to participate in my family’s activities; I began by serving in an educational institution that was founded by my aunt. That same aunt taught me the Qur’an and trained many members of my family in life. I traveled a bit everywhere during this period. I was in Saudi Arabia, and later Agadir [Morocco] for two years. How much time did you spend in Saudi Arabia? My parents were in Saudi Arabia for 15 years. I mostly stayed in Senegal, but after the school year ended, I would visit them there. I also came to Washington, D.C., to attend a conference and maouloud. The maouloud is an event that explains the life of the Prophet. It recounts how the Prophet was raised and how to model your life after his, even after learning the Qur’an. I was also introduced to the family fields and farming. As you know, in Kaolack, many are interested in agriculture and raising livestock, even during the rainy season. After the rainy season, there is great interest in truck farming post-season with new methods. It’s a family that has long been well-known for education. Our fathers and great grandfathers were people who taught, who helped others, and who put them on the path to Islam. Above all, they put others on the path of the Tijaniyya (tariqa Tijaniyya), whose supreme leader is Sheikh Mahamadou Tidjani. As you know, he’s based in Fez, Morocco [the birthplace of the Tidiane confrérie]. That’s why Fez is particularly important to us. So, in general, the family’s primary concern is not just the family. Developing one person or helping one person does not interest us. What interests us is developing an entire population, developing everyone, developing the entire world. Our grandfather Sheikh Ibrahim said that life is ephemeral, and that after life we are meant to go elsewhere; we are meant to go to the afterlife. From the spiritual side, we are a family and as the hadith of the Prophet states, “If you do not know me, how can you worship me? If you do not know me, how will you do that which I ask of you?” From the spiritual side, what is essential before all else is to arrive at this stage in life. It’s the work of our fathers, our grandfathers, and our forefathers, and also ours. What are the interests of the Niassene family? We’re interested in development. We’re interested in everything that can improve a human being. We must live our lives as if we have eternal life on this earth. But, we can’t forget that one day we depart to the afterlife. So, we must work for life but also for religion. Religion is the one thing that will remain with us. And as you can see, our family is represented around the world. Our disciples are everywhere; we have many people that have followed the path of the Niassenes. The founder, Sheikh Ibrahim, was always interested in education and development. He was also interested in advancing the human being. We follow that same path; we help people build a life, but also succeed in that life. We have projects in agriculture and animal breeding, but also in social development. Can you give some examples of your activities in social development? Each year we organize free medical consultations with an organization of which I am the president. We do this in the rural areas of the country with the goal of helping people that cannot travel to Dakar or elsewhere to seek medical attention. One year we organized ultrasound screenings with an organization called Medisol. They helped us by traveling with us to consult with women. Is the organization a Senegalese organization? Yes, it is a Senegalese association. In particular we envision building schools and health clinics. We help others by assisting them in finding work, and so that they can make a living. Instead of helping someone every day, it is better to teach them how to be independent. Instead of giving a fish to someone every day, it is better to teach them how to fish at sea. Teaching them to be independent helps them in the long-term, and it may also serve others in the process. However, if you are used to always giving to someone, they will become dependent upon your aid. And the day that they do not see you [giving], they will believe that the world has stopped although that’s not the case. As I mentioned, we traveled all over the world in the context of helping our neighbors. We are in a changing world. We are also in a world where someone who has no point of reference risks getting lost. The world is very advanced and, if you do not organize yourself and if you do not know yourself, then you risk becoming involved in or returning to nothing. It’s for this reason that our community is one that helps in developing the person. The interior is just as important as the exterior. What you see as beautiful from outside must also be beautiful from inside. It’s for this reason that it’s so important to know our role in life; it’s not to build ourselves, but to help others in building themselves and to go to the afterlife. It’s for this that I see the initiative of Serigne Saliou Mbacke [the working group] as a very important project. And as we have seen in Morocco, they are succeeding [with family planning] because they have engaged religious leaders. Religious leaders play a very important role. They are heard and they are followed, and that is a very good thing. We told WFDD that the results will come in the end. But, as is the case in Morocco, arriving at the results will be a bit difficult. But the religious leaders know how to address the issues and where to go. It’s for this reason that we congratulate you for advancing this effort, and we ask that you remain patient for the results because we have already worked on this subject time and time again. But, as soon as someone brings up family planning, they automatically think of stopping or limiting births, although that is not the goal of family planning. Rather, the goal of family planning is to organize the family. Thus, the organization of the family is the organization of the population, the organization of the population is the organization of the nation, and the organization of the nation involves the entire world. No one can live entirely self-sufficiently and no one can live entirely alone, so they must open themselves to the world. The experiences and developments that we can see allow us to help others to follow that same path. What is the name of this organization and the types of activities in which you are involved? It is known as Mame Astou Diankha Association. Rokhaya Thiam is the president and I am the honorary president. Mame Astou Diankha is the name of Sheikh Ibrahim Niass’ mother. As I said before, the organization aims to help people out of poverty, to take them out of fatigue and to help them move towards development. We work in education, health, and development more broadly. In fact, many people come to solicit prayers, but just as many come to ask for assistance. It is for this reason that we are aim to find solutions to the problems—to bring solutions not only to people that we know, but especially to those that we do not know. I will give the example of a talibé [student or follower]. This talibé was sick. He was in his bed. Some members of the family brought him water to drink and others offered him air because it was all that they could offer him. I came and I saw him in his bed and I immediately called the organization. They sent an ambulance to take him to the hospital. He stayed at the hospital for two months and when he left, he was healthy again. He said that if he had stayed in his bed, he would have died. If someone is sick, they must go to the hospital. So, we are approaching the population to help them out of poverty and towards development. The Niassene family has long been involved in education. Can you explain the role of your family in this domain? My family is obligated to teach. With our aunt, I began to study the Qur’an in my own home. Now we have schools all over Senegal. Why? Sheikh Ibrahim said that women should not stay at home just to primp and dress themselves. On the contrary, he asked them to participate in society just like the men. That is to say, he asked them to have a professional life and to take their place in society. My aunt realized this early on. She took care of us and taught us; we didn’t study with her just because she was our aunt. She taught a lot of other people as well; she even taught people of different nationalities, people that she didn’t know well either. She had a certain distinctive feature. As soon as she saw a child, she believed herself to be the only person who could take care of them. What’s more, I remember that each year, my aunt organized trips to reward those who devoted themselves the most to teaching in order to encourage and further develop the tradition of teaching. Many people passed through her to success in life. Today, many of her former students occupy very important roles in society. You mentioned that some of your aunt’s students come from other countries. How did they know that your aunt was a teacher? Had they heard of her through others? Some had certainly heard of her, but as I have mentioned, my family was well-known in education. Also our schools are very different from others. Many people preferred to give their children to our family, knowing about our family’s dedication and sacrifice to education and especially teaching the Qur’an. The Niassene family has been part of the Tijaniyya for generations. Could you tell me more about the family’s history? Our grandfather, El Hadj Abdoullah le Grand, came from Morocco directly in contact with the Tijaniyya family. He was not only authorized to teach others in Senegal about the Tijaniyya, but also to develop the order. The Tijaniyya is a path that is based on the Qur’an and the Sunnah. So, what interests us the most is education based on these fundamental texts. There is a strong hierarchy in the confréries in Senegal. How does this hierarchy function? You can say that the Niassene community functions as a state, with all of its members and representatives working for the khalife. Their objective is that things be done as they should be. For example, the khalife cannot be everywhere at once, but he has his representatives; he has ambassadors and ministers to assure that directions are followed and objectives are achieved. The other Tidiane families operate in the same way. The Niassene family constitutes one family, but we are all together. In Senegal, there is for example the Omarienne family among others, which is also a part of the Tijaniyya. Is there any collaboration between the Tidiane families in Senegal? There is a perfect collaboration. And this has existed since the beginning because we are all part of the same school [of thought] and we have the same roles to play. Can we return to the topic of your participation in the working group? How did you become a member of the working group? Being a member of Mame Astou Diankha and working in health, I came into contact with Serigne Saliou. The United States Embassy organized a program during Ramadan; I was invited, though in the end I did not attend but I was later put in touch with Serigne Saliou. Since I am in the family and am active in the areas of health and development, my cousin Ben Oumar Kane, an assistant to the Embassy, put us in touch. Why do you see your involvement in the working group as important? Our involvement in the working group is important because we want to see a successful family planning effort across Senegal and also in neighboring countries. Participating in the group will help in raising awareness on family planning and making it understood that family planning is not the limitation of births; that is not permitted. We are not talking about limiting births, but rather of organizing the family. We are talking about helping mothers and children between the ages of zero to 5. We see that infant mortality is high and that maternal health is especially important. So, we will help in raising awareness and in making the message heard. When we see people on the ground defending the same cause, then that is a sign that our cause will succeed. For this reason we became part of the group, and we want to succeed in this program as well as in other things. Have your attitudes on family planning changed since you first became involved with the working group? Yes, they have changed a lot because hearing the term “family planning” often causes others to think of not having children, which is not the purpose of family planning. We had understood before that this was in fact what family planning involved. Now, however, we have come to understand the matter differently and realize that a vision of limiting family size is not the right approach to the matter. When we took up the issue and joined the working group, we reached a different understanding and the matter became clear to us. The debates on the topic are also clearer, and we now understand the message that we need to transmit. Is there anything else that you would like to add about your family? It is an educational family where the primary responsibility is to teach and to know. Knowledge and teaching help us to develop. The family is grounded on this ideal and also works toward it. Early on, our parents and our grandparents worked in agriculture and they continue to raise livestock. That is one important aspect and guide for our family, and many people choose to follow that path as well. They come to the farms to perfect themselves and to be useful to the world. The founder in Kaolack established the order to teach about the correct practice of Islam and for work. I believe that what revolves around these three domains is what leads to human development. Thus if we see someone who wants to join their hand with ours with the goal of succeeding, we will stand beside them. What they will accomplish is to become useful to the entire population, and that will be a reference for the future. It will be an example to follow. It will be something useful.